Market interest toward Micro-LED panels has risen in recent years, following news of Apple working to develop the next-generation display. Micro-LED panels, which feature miniature light-emitting diode arrays with smaller, brighter modules and improved response speed, are also the next-generation target for Samsung and Facebook’s Oculus, but still remain rare in the market due to technical challenges. Samsung’s long-term LED partner Lumens is one of a handful of companies that are ready to commercialize Micro-LED technologies this year for an automotive head-up display. “We plan to launch the world’s first high-definition, automotive head-up display using Micro-LED technology by the end of this year,” said Jung Tae-hong, president of Lumens, in an interview with The Korea Herald. Automotive head-up display, or HUD, is a transparent display that presents data in automobiles without requiring users to look away from their usual viewpoints. HUD consists of a windshield type that displays digital transparent images on a car’s windshield and a combiner type in which the image is shown on a small, transparent plastic disc called a combiner instead of the windshield itself. Lumens said Micro-LED panels are suitable for HUD as they can better withstand high temperatures and provide better readability under direct sunlight than liquid-crystal displays currently used for HUD. “We will first unveil the combiner type of HUD for the automotive aftermarket this year and will expand into the windshield or built-in type in cars within two to three years,” Jung said. Lumens said it is now in talks with local and global automakers to provide the windshield type of HUD and that it is highly likely to see the windshield HUD built in for some automakers in three years. With the focus on the automotive HUD market, the tech firm aims to see a turnaround in three years. The global HUD market is predicted to grow 29.6 percent annually on average from 2015 to 2025 to reach 36 million units by 2025, according to US market research firm Tractica. Lumens plans to expand the application of its Micro-LED technologies into more diverse devices beyond the head-up display. Separately from HUD panels, the firm is also developing production technologies that make mass production faster and at a lower cost in partnership with the state-run Korea Institute of Machinery & Materials. The technology will be capable of picking and placing thousands of chips at a time to dramatically shorten production time. For instance, it would take only one hour to produce a 100-inch signage compared to traditional LED production that takes more than 30 days. Industry watchers expect that Lumens’ Micro-LED technology will be used for a major manufacturer’s digital signage display panels possibly next year, although Lumens declined to make any related comments. 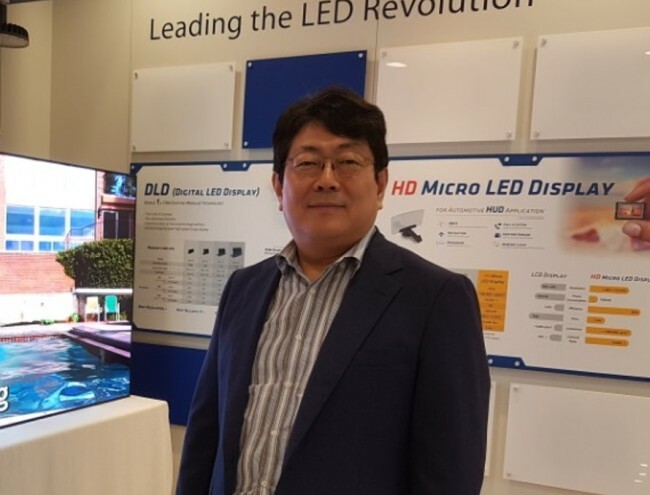 “We view the Micro-LED as the final destination for next-generation displays, considering its resolution and efficiency,” President Jung said, adding it has around 30 percent higher power and cost efficiency than LED. The global Micro LED market is expected to grow 54.7 percent on an annual average from $250 million in 2017 to $19.9 billion by 2025, according to research firm MarketsandMarkets.